The MiG-21 MF is a single-seat, single-engine multi-purpose combat aircraft of all-metal mid-wing monoplane construction. Its fuselage of semi-monocoque construction accommodates electronic equipment, pilot’s cockpit, fuel tanks and the power plant. The semi-monocoque delta wings house fuel tanks and the main wheel wells, and are fitted with flaps and ailerons. The power plant comprises the R-11-300 or R-13-300 turbojet with afterburning. The armament consists of a twin-barrel 23 mm GSh-23L type cannon with 200 rounds in a detachable ventral pack. Disposable stores are carried on four underwing hardpoints and comprise various combinations of bombs, guided and unguided rocket missiles. The centreline and outer underwing pylons can store auxiliary drop tanks. The first versions of MiG-21 entered the service with the Polish Air Force in 1961. Since then, the type underwent numerous modifications. The reconnaissance MiG-21R was developed into the combat version – MiG-21S, followed by MiG-21SM. Their combat potential led to introduction of an export version – MiG-21M. The upgraded MiG-21MF version featured the characteristic rearward-viewing periscope and deflectors preventing the gun gases from entering the additional air intakes. Although the standard MF version was equipped with R-13-300 engine, the Polish units received aircraft fitted with older R-11-300s. Some aircraft were re-engined with newer power plants during general overhauls, at a later date. The first batch of 9 MFs was received by 1st Squadron of 34th PLM (Fighter Arm Squadron) in December 1972. Further deliveries commenced in February 1973 and were continued until the end of 1975. 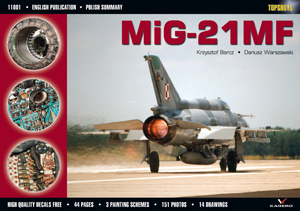 Altogether, the Polish Air force received 120 MiG‑21s MF. They were used by: 41st PLM stationed in Malbork (where they replaced the M versions), 26th PLM based in Zegrz Pomorski (20 aircraft in 1974), and by 34th PLM (the last delivery – 20 aircraft). Beside the combat versions, some MiG-21 UM trainers (overall 52 aircraft) were delivered between 1971 and 1981. In 1977 the MiG-21s MF of 28th PLM were transferred to the 11th PLM stationed in Wroclaw and the 9th PLM in Debrzyn; in 1978 MiGs MF were also flown by the 10th PLM in Lask. In 1999 the 11th PLM from Wroclaw was disbanded. Its serviceable MiG-21s MF were taken over by the 10th PLM in Lask and the 3rd PLM in Poznan. Those units were re-designated as the Autonomous Tactical Air Support Squadrons (ELTs). 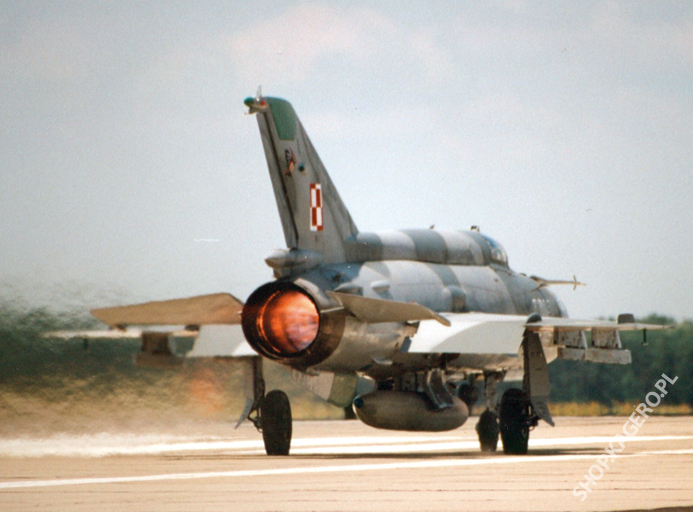 The 3rd, 10th, and 41st ELTs stationed in Malbork were to be the last units to fly MiG-21s in Poland. The final period of their deployment resulted in abundance of colourful painting schemes.